As summer approaches, you’re probably hurrying to get ‘summer ready’ for all that time you’re going to spend by the pool or on vacation. When the summer arrives, most people go on vacation or spend time at the community swimming pool showing off the fact that they were ready to sport a swimsuit by the time summer came along. If you feel those winter pounds still sitting on your hips and waist and the longing looks you are giving to your too small summer clothes are getting embarrassing, it’s time to get motivated to workout this summer or stay motivated so you can feel great and look fantastic. Summers are hectic, fun, and are overly planned to ensure you make it to each destination spot you’ve wanted to go to. 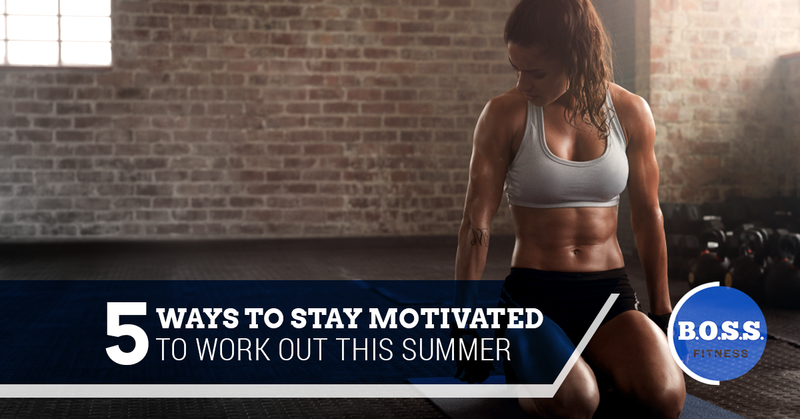 It can be hard to stay motivated during the summertime and even harder to start exercising in the summer. At B.O.S.S. Fitness, a fitness center in Columbus, OH, we want to give you some methods to help you stay motivated whether you’re starting to exercise or need to continue to do so. Below are five ways for you to stay motivated this summer to get into shape. Whether you’ve been exercising for years or you’ve just started, it’s important to stay motivated in the summer. Summertime can be a busy time for most and you can even feel lazier because it’s so hot and humid outside. Eliminate the need to sit in air conditioning and drink cool beverages while munching on wings. Instead, commit yourself to exercising through your summer so if you aren’t already summer ready, with our help by the time August rolls around you’ll feel more comfortable when you settle by the swimming pool to soak in some rays. The first way to get motivated this summer to exercise is by changing up your routine. If you’ve just decided to start moving your body, then you’re probably settled into a routine you like. If you’ve added a wide variety of weight training and cardio and have worked with a personal trainer, then you’re probably good to go. If you have been exercising for years and are growing tired of the same run day-after-day, then take the time to try something new. Additionally, you can change up your routine by going outside. Take a bike ride in your favorite park or do some yoga while the sun comes up. Another great way to change your routine up is by exploring a summer sport you’ve wanted to try for awhile but haven’t had the opportunity to attempt. Summer is a great time to try something new and fun. Getting into a routine can take awhile 20 days to be exact. When you commit to at least 20 days of exercising, you’ll find that you not only want to do it, but you feel great afterwards. Routines for day-to-day activities help you become committed and comfortable in what you’re doing. It will also feel strange when you miss out on a day and you’ll find yourself not wanting to skip your Thursday night aerobics class or your personal training appointment on Sundays. 20 days is all it takes for you to get hooked on exercise, so just plan something for three weeks and see what happens. Another great way to stay motivated is by updating the music on your iPod, cell phone, or some other device you use while you workout. Music is one of the best ways to get your body going. Whether you like to exercise to metal, reggae, or anything in between, you’ll find when you add some new tunes you’ll deeply enjoy exercising more. No one likes listening to the same music day-after-day, so skim the internet for some new beats you can play while you work your body. You know those clothes we mentioned before that are sitting in your closet even though they are too small to wear? Well, consider those clothes to really get you geared up to exercise. Everyone has a few items they love but are too small because some winter weight is lingering. If you’ve decided to put off exercising for the next day, think about those clothes or that swimsuit you really want to fit into. Remind yourself if you want to wear those pieces of clothing that look cute on you and show off your best features, you’ll feel much more ready to head to the fitness center, so your vision can become a reality. The best way to get motivated is by finding a partner to exercise with. Some people like ‘me time’ when they exercise and others like to find a partner to get them motivated. If you haven’t exercised in a while, then it’s best to find a partner because you’ll commit to exercising instead of deciding not to go at the last minute. If you’ve been exercising for awhile, but need a way to stay motivated in the summer, then remind yourself you need some alone time to feel refreshed and rejuvenated. To create an exercise regime that will work for you, stop by our fitness center to meet with a personal trainer. We look forward to helping you get in shape and stay motivated to become the best version of yourself.